Order online and get 10% off! Order now! Fred the owner at Pepe's, that is a big supporter of Menehune Basketball. Look out for the Pepe's logo on the green away Menehune Jerseys! 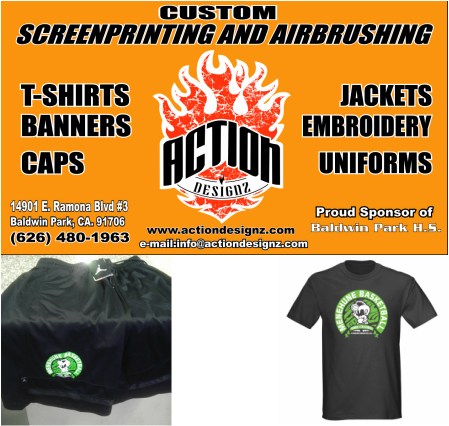 Menehunes get all there gear from Action Designz. The CEO Andy Ortega, makes sure that the Menehunes are looking sharp out there on the court. If your looking to do custom designs or t-shirt orders this is where you need to go! They have a website www.ActionDesignz.com. Nothing but the best quality for the Menehunes! Thank you Action Designz for taking care of the Menehunes Ohana!